Not everyone who does financial planning is a Certified Financial Planner™. To obtain the CFP® designation, a person must study and demonstrate competency in five areas vital to comprehensive financial planning, including insurance, taxes, retirement, investments and estate planning by successfully completing a comprehensive examination. The emphasis of the CFP® education program is on the interrelatedness of the financial areas and the need for an objective analysis of a client's circumstances and goals. The CFP® professional must also meet educational, work experience, and ethical standards to maintain the use of the CFP® mark. An Enrolled Agent is a federally licensed tax practitioner who has demonstrated technical expertise in the field of taxation and is empowered by the Department of the Treasury to represent taxpayers for audits, collections and appeals before all administrative levels if the Internal Revenue Service. LUTCF's have technical training in the various uses of life insurance contracts. The LUTC professional education program examines the many types of policies and various ownership arrangements considering tax laws. 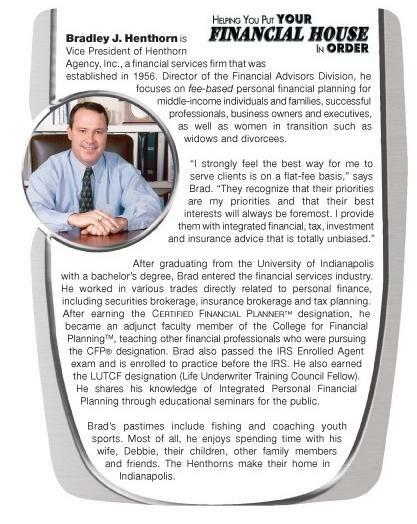 After obtaining the CFP® certification in 1995 from the CFP Board of Standards™ located in Denver Colorado, Brad became an Investment Adviser Representative of Henthorn Agency, Inc. Brad also prepares individual tax returns and consults individuals on a comprehensive basis regarding personal financial matters. As an Adjunct Faculty member, Brad instructed local classes for financial professionals working toward their Certified Financial Planner™ designation. Specialized in securities and issues relating to the investment portfolio’s of individuals. Traded stocks, bonds and mutual funds as well as variable annuities and other forms of securities. Specialized in life insurance , securities based insurance contracts and the tax treatment of such contracts for individuals and business owners. 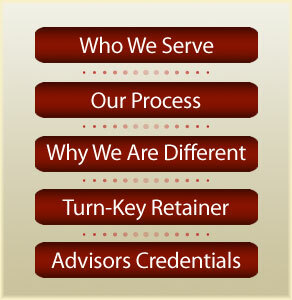 Set up retirement plans and other qualified retirement plans for individuals and business’s. Also set up health insurance programs and deferred compensation programs. Specialized in property and casualty insurance for individuals. Selection of appropriate policy forms to cover clients assets as well as set up coverage’s for potential liability claims. Bachelor of Science degree in secondary education.